KoKo Pro is Organic Labs’ latest proprietary product for the home gardener! Derived from coir (the fibers of coconut husks), KoKo Pro is totally organic and a superior peat moss replacement for use in mulching, as a potting soil medium and as a soil amendment for remedying poor soil quality. KoKo Pro is available in a compact, lightweight block that is easy to carry and expands with water. 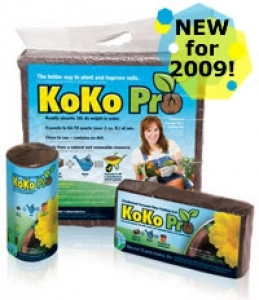 Just 10 pounds of KoKo Pro makes more than a heavy bag of traditional potting soil! KoKo Pro absorbs ten times its weight in water so it resists drying out, requiring less irrigation and offering more product for your dollar investment. Unlike peat bogs, which take centuries to regenerate and are home to wildlife, coir is 100% renewable too.